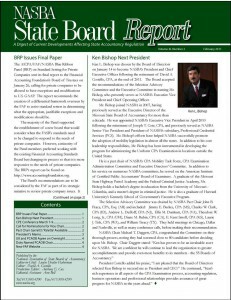 The NASBA Compliance Assurance Committee (CAC) is continuing to monitor the American Institute of CPAs’ Facilitated State Board Access (FSBA) initiative, CAC Chair Mark P. Harris (LA) reported at the NASBA Board’s April meeting. The program is designed to increase transparency by giving state boards direct access to the peer review reports, unless a reviewed firm indicates that such access is to be denied. In cases of denial, the state board would be given access to the name of the firm, date of acceptance of the firm’s most recent peer review, or advised if the firm’s enrollment had been terminated. CAC Chair Harris told the NASBA Board that the implementation schedule was changed after a pilot program found that bringing smaller groups of states on at a time improves the training for and understanding of the new online accessed system. Complete implementation is set for mid?2009. However, AICPA Senior Vice President Susan Coffey told Mr. Harris that participation by firms in the program is higher than initially predicted. Currently 43 states have mandatory peer review for license renewal and 34 state boards are eligible to participate (both mandate peer review and are not prohibited from access to the reports). The AICPA’s pilot program involved six states: North Carolina, Ohio, Oklahoma, South Dakota, Tennessee and Texas. In Tennessee, just the state society participated in the pilot because the state board is prohibited by law from access to the information. Only firms that received an accepted review during the pilot period could participate. According to the AICPA, now that the pilot is completed, Michigan and Virginia will be the next two states to move forward with early adoption of the FSBA. Three task forces have been established by the CAC, Mr. Harris reported: James W. Goad (AR) leads an Oversight Issues Task Force which is reviewing each of the components of the AICPA Peer Review Programs’ Oversight Models. James S. Ciarcia (CT) is leading the CAC Peer Review Implementation Task Force to encourage mandatory peer review and the adoption of related Uniform Accountancy Act Model Rules and to provide guidance on the FSBA program. Jimmy E. Burkes (MS) chairs the CAC’s State Board Oversight Task Force that is working to motivate more boards to establish a peer review oversight committee. Information about these task forces’ activities will be presented by Committee Chair Harris at the upcoming Regional Meetings.